The Dandelion theme is highly flexible, so changing the color scheme is super simple and for the most parts you won’t need an image editor. The theme is best suited for any business, portfolio, photography and personal sites. This theme includes not only a really cool Thumbnail Slider, which is great for the easy showcasing of a large number of images, but also a Nivo slider which allows for a wide variety transition effects and an Accordion slider which is very suitable for presenting more information. Also, in version 2.6.7 of the theme we have included a new Content slider which is great for presenting more content with the images. Images are easily added or removed, or the main slider settings changed, via the admin panel. Additionally, you can use each of the sliders on different pages with different image sets. 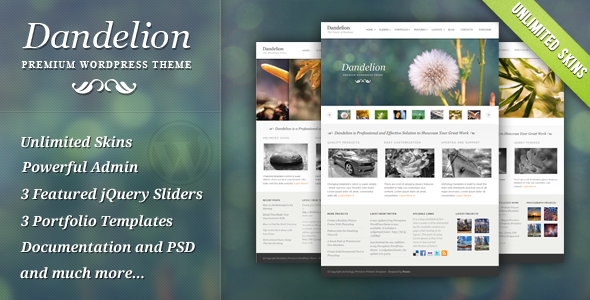 Share the post "Dandelion – Powerful Elegant WordPress Theme"